Our new 12-string "Grand Railboard"® model is now in production and we're taking orders with priority to a short list of existing Stick owners who have been most patiently waiting. 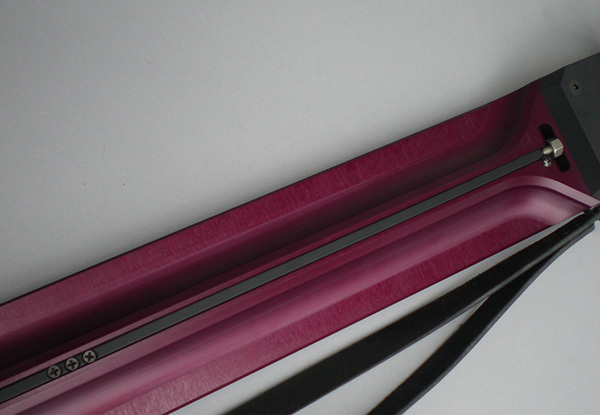 This first run of 20 is mostly hard-anodized in four colors, black, dark blue, plum and a redder red (instead of "maroon"). 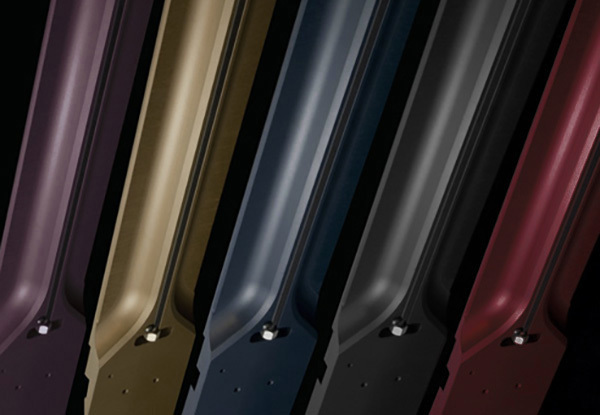 Five of these are being plasma plated in three colors, gold, nickel and dark "gunmetal". All have dot (or "bowl") markers in this first run and the linear ("gully") markers will be added to next runs. 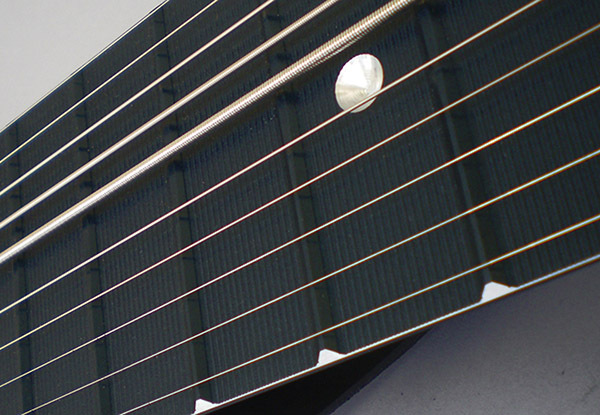 The hard-anodized front surface is textured with fine machine cut lines in the fret spaces across the fretboard as with our standard 10-string Railboard. 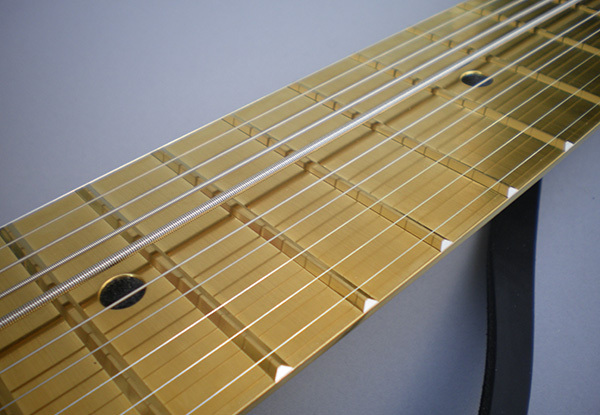 The metallic plasma fretboard has a fine brushed texture in all the fret spaces to produce more of a glow instead of a mirrored shine. 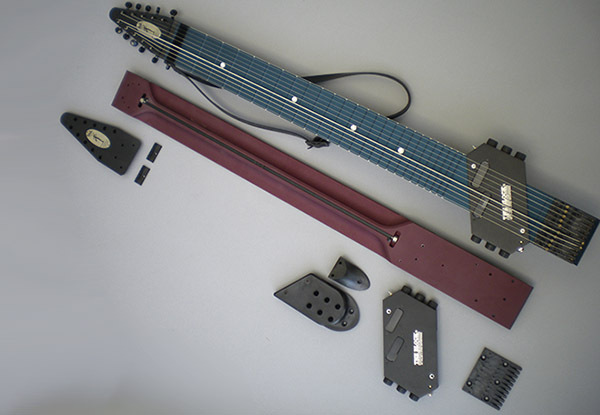 - Integral "Rail" frets CNC machine cut out of one aluminum piece together with neck and fingerboard. 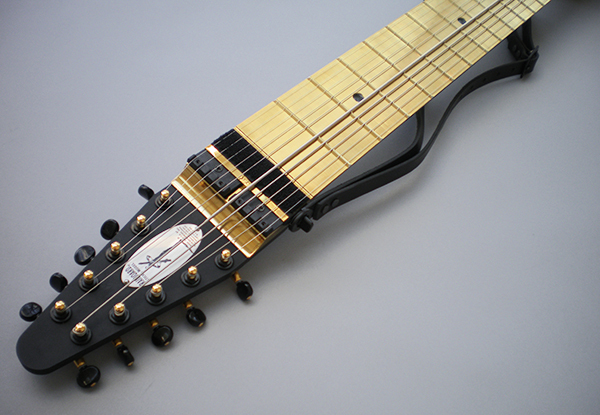 - Extra distance between "Flaps" dual nut and "X-fret" (first tapped fret position) for uniform sound and feel. - R-Block with versatile tone shaping, auto-switching from passive to phantom powered active modes, and stereo to mono. 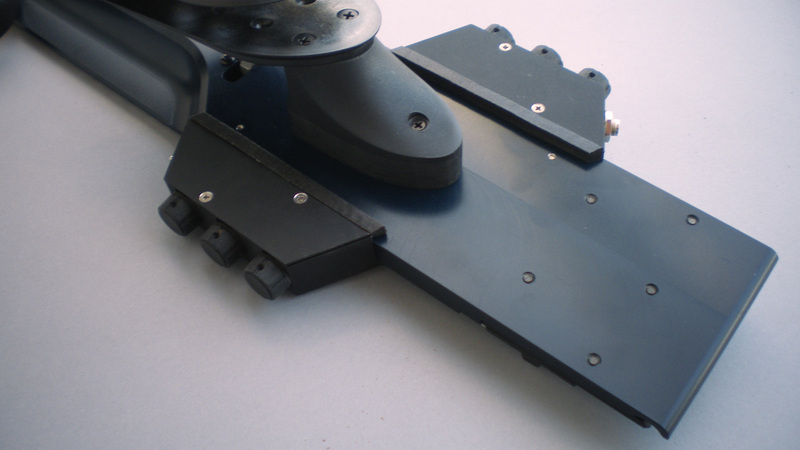 - All cables and stereo splitters for passive and active modes. - Divided "4-Way" truss rod for independent control of fretboard profiles (straight high pitched half and slightly bowed "relief" at low pitched half). 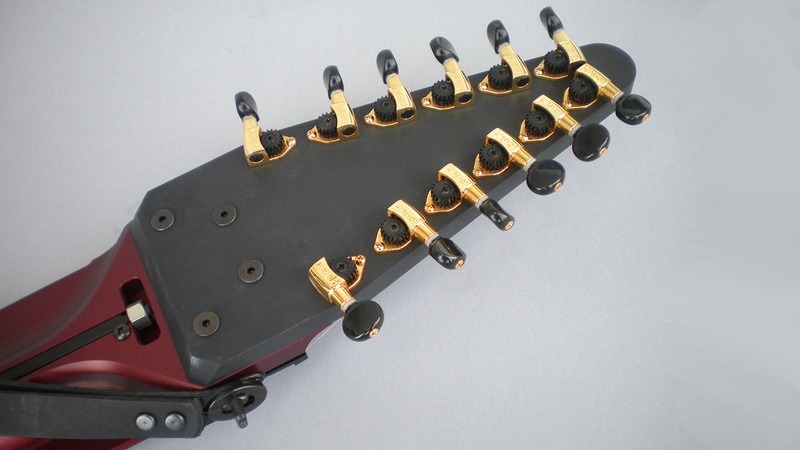 - Adjustable bridge saddles in three dimensions: up and down for lowest tapping "action", back and forth for true octaves, and slightly angled for uniform string spacing. 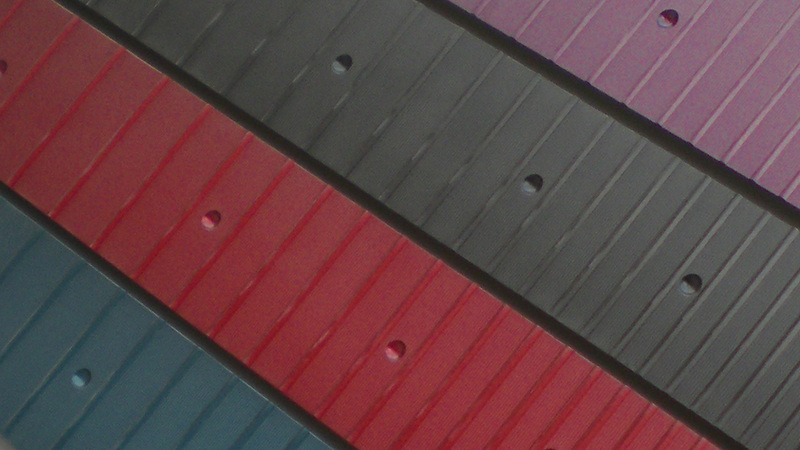 - Fretboard markers filled with a wide variety of glitter colors or aqua glow, also dots or lines in the recessed color finish of the hard anodized beam itself, or recessed dots in exposed aluminum. - Optional custom Roland MIDI pickup for either the melody or bass string group. This 12-string Railboard model has the same string spacing as our hardwood and bamboo Grand Sticks and uses the same hardware at bridge and nut. Center to center string spacing is .305" or 7.62mm. 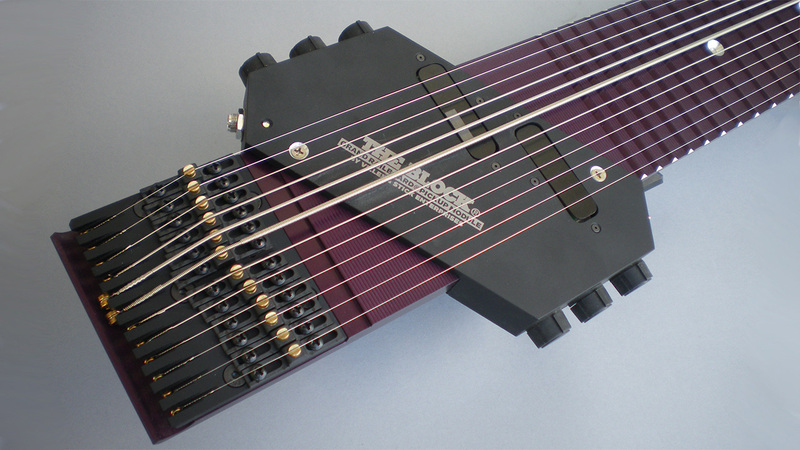 String group spacing (center to center from 6th to 7th strings) is .400" or 9.14mm. 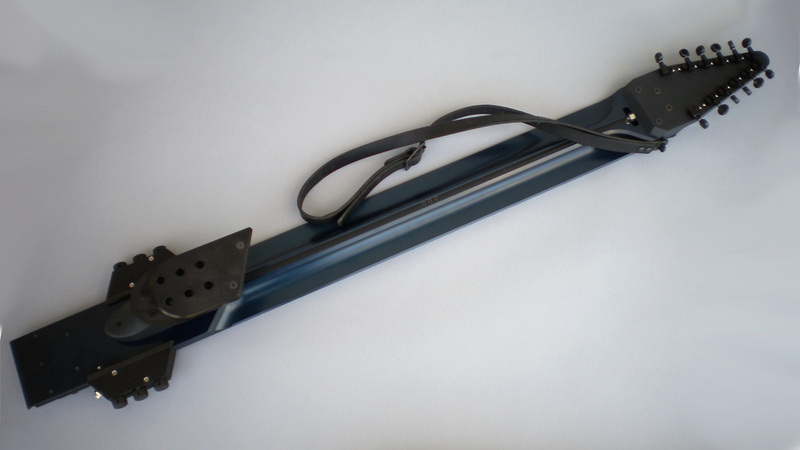 The Grand Railboard can be ordered with any of our standard Grand Stick tunings, or any custom tuning within our broad stock ofstring gauges. 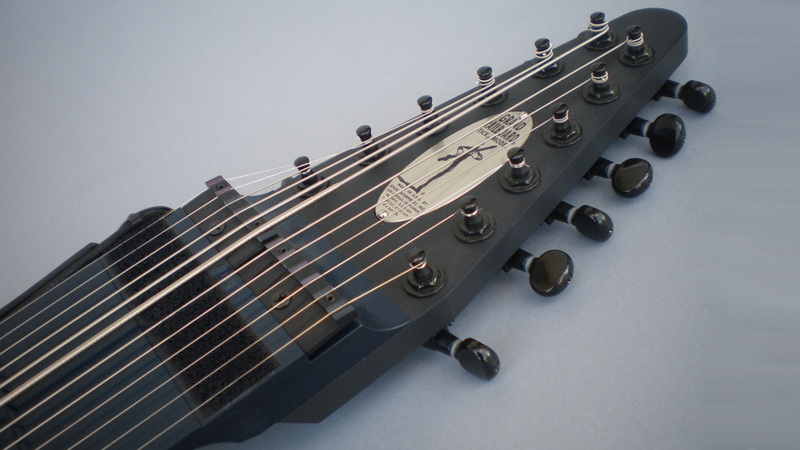 * Overall fretboard beam width is 3 3/4" compared to 3 1/2" on the 10-string Railboard, that is, 1/8" wider at each edge. * Overall instrument length is 45 3/4" compared to 45 3/8" on the 10-string Railboard, or 3/8" longer because of the 12-string bolt-on headstock's greater length (9 1/2" compared to 9 1/8"). 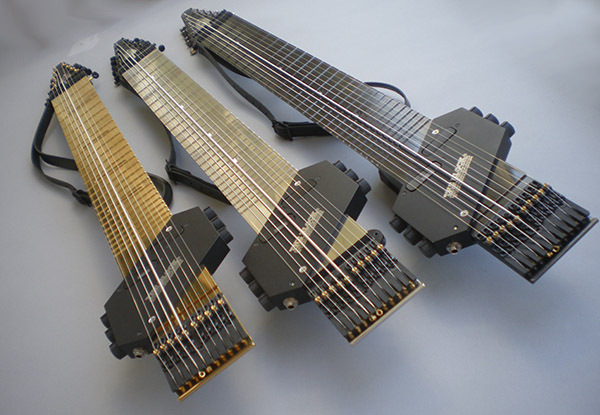 * A fully assembled Grand Railboard weighs 9.3 pounds compared to the 8.6 pound 10-string version. This new one-piece aluminum "Grand" model combines all advanced Railboard features with our standard hardwood Grand Stick string spacing so as to reduce unnecessary fretboard width and instrument weight. 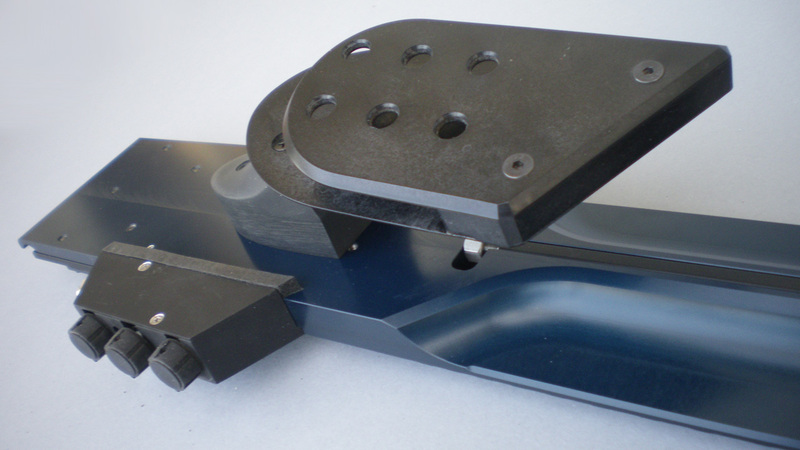 I hope you'll enjoy the precision, the very low action, light touch and reliability of the all important setup. Gold, nickel and "gunmetal" colored very hard vapor depost metal plasma coatings. Gold metal plasma Railboard closup, with black glitter dot inlays. All of the parts that make up the Railboard. 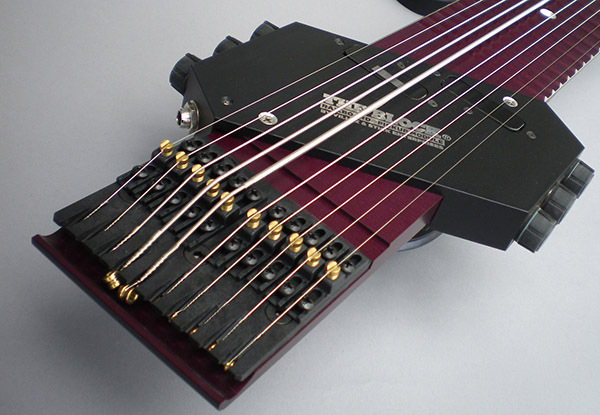 Black hard anodized surface shows the traverse lines pattern between the frets, and the exposed fret ends. 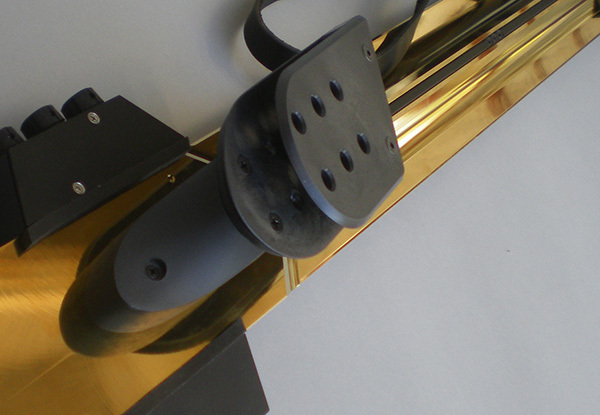 The belt hook pedestal mounts on the beam, and the R-Block module wraps around it. 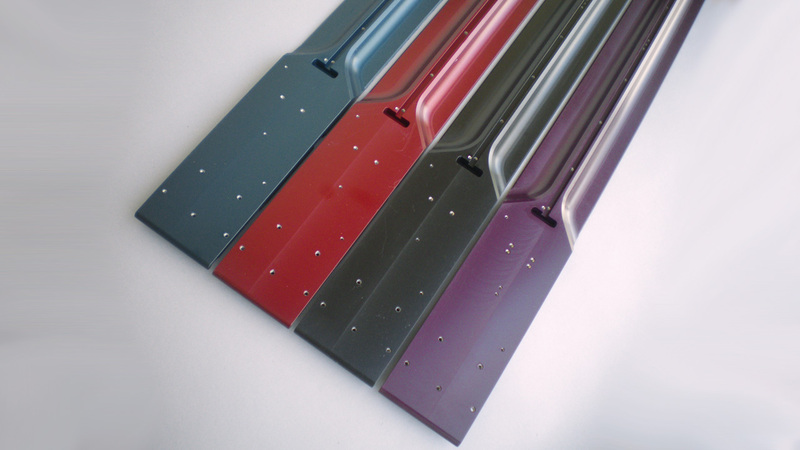 Whereas our regular Railboard productions are hard-anodized to build up the thickest possible layer of rock-hard aluminum oxide on all aluminum surfaces, this zirconium-based plasma coating is even harder and is commonly used on drill bit tips to prolong work life. 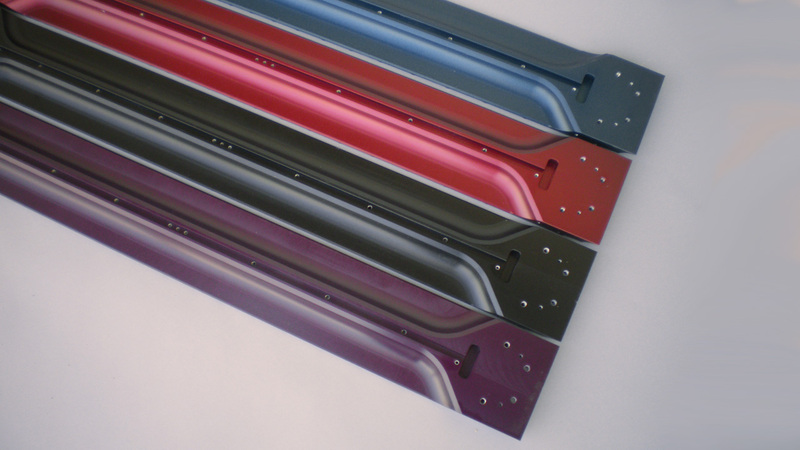 The front fretboard surface is brushed before vapor coating to diffuse the shine and create more of a glow. The Rails themselves are mirror finished and contrast nicely with the brushed spaces between them. 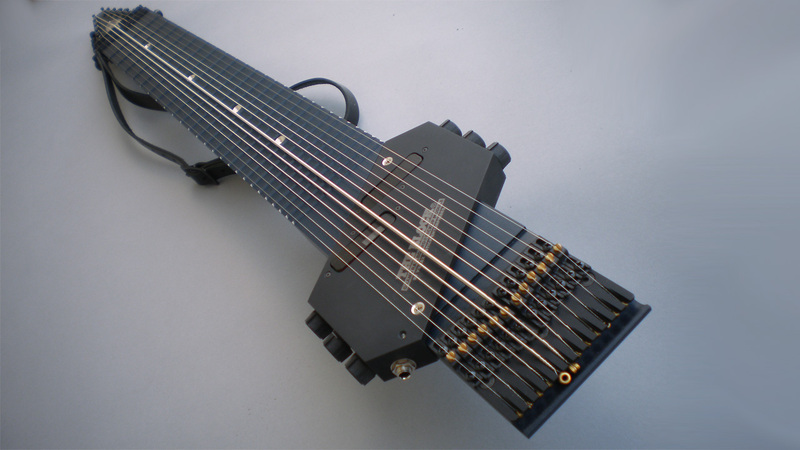 The feel is very smooth for string bending and vibratos. Rear and side surfaces and fretboard marker cavities are also mirror finished. This metallized finish adds $300. to the price of the Railboard. 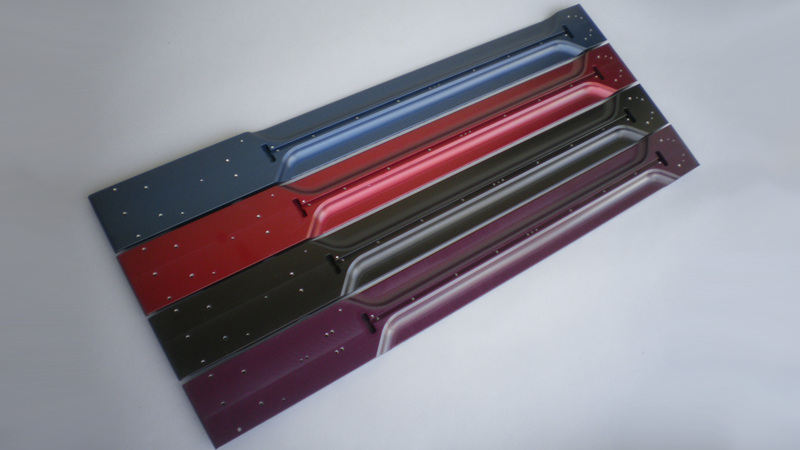 It's a costly four-step process of building layers onto the machine cut aluminum neck beam, starting with copper, then nickel, then chrome and lastly the very hard plasma coating. Gold metal plasma Railboard with black and gold tuners and black glitter inlays. 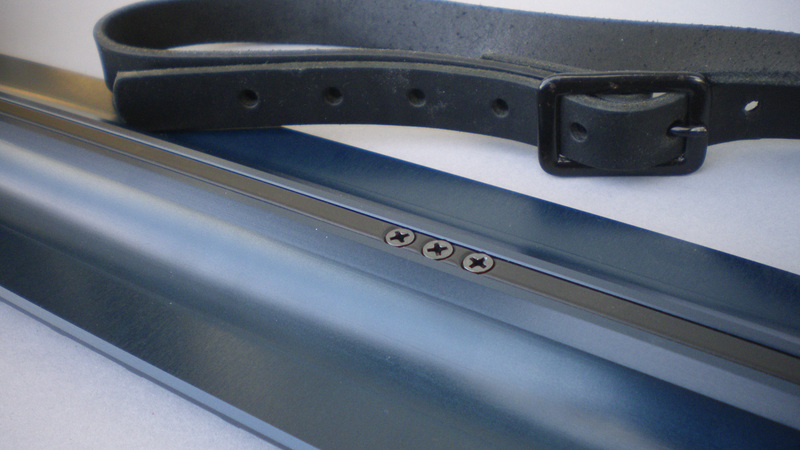 The channel for adding a MIDI pickup is already machined by the bridge. The rear of the beam holds the truss rod in its "keel". Copyright © 2019 Stick Enterprises, Inc.